May Day mayday! A tale of extraordinary weather and extra-ordinary lasagne. | There once was a creek . . .
May Day mayday! A tale of extraordinary weather and extra-ordinary lasagne. It’s been a long time between posts. As per the forecast, my PhD has reduced this blog from a bubbling stream to a lifeless dry creek bed. But any stream can be revived with a little rain. 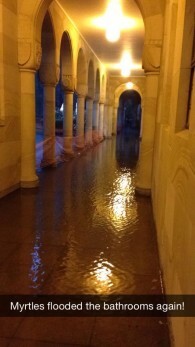 And with a lot of rain, it all comes flooding back. 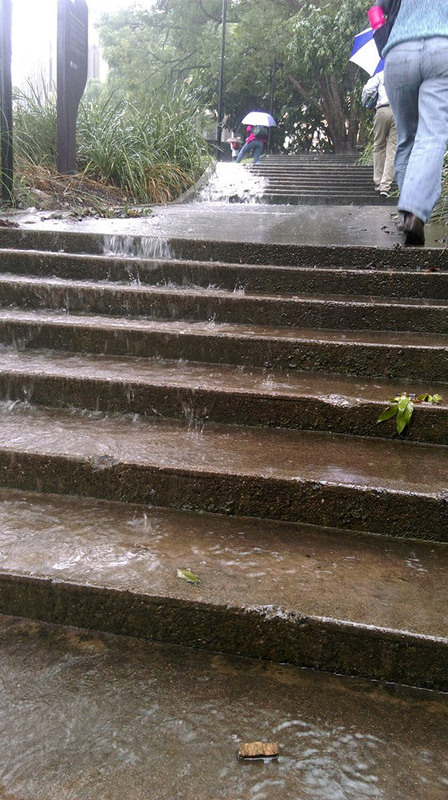 ‘UQ Falls’ – posted to the Facebook group ‘UQ StalkerSpace’ by Panashé Machinguara just after midday on 1 May 2015. Personally, I’d had enough of the rain long before any records were broken. My trip into the University of Queensland at St Lucia that morning took nearly two hours because of a track fault somewhere near Yeronga Station. 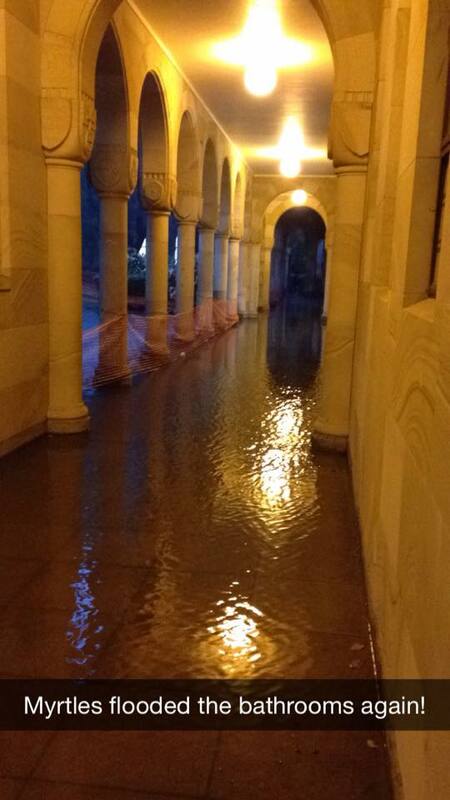 ‘Local flooding’ was said to be the cause. I enjoyed the rain a lot more from the other side of my office window, but was forced to venture out again at around 4pm. 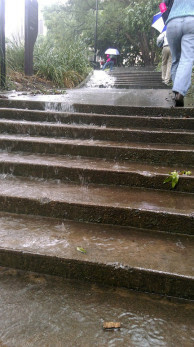 By that time, every road and pathway on the campus was a raging torrent. Once I was back in the office, I resolved to stay there until the worst of the deluge passed. But the worst of it just kept coming. Getting home under these conditions seemed a futile prospect. The bus stop by the UQ Lakes would have been unreachable except by boat, and the buses and trains were apparently all delayed anyhow. Sleeping in the office was starting to look like a reasonable plan. Staying put, however, raised another problem: I had to eat. Under the partial cover of my collapsed umbrella, I braved the rain once more to make it to the Union complex. Had I not been eating pizza all afternoon, a pizza from the UQ Pizza Cafe would have been the logical choice. 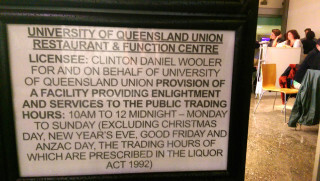 Instead, I had my desires set on a burger from the Red Room, UQ’s student bar. But on this particular night (or perhaps every Friday night, for all I know), the Red Room resembled the type of party you might have had as a teenager in your parents’ garage, right down to the barbeque sausages and plastic cups. I stood there for a moment, dumbstruck in a daze of uneasy nostalgia. Then I walked straight back out. I didn’t know it yet, but destiny was calling. I was running out of options. Burger Urge was probably open, but it was at the other end of campus: who knows what kinds of sea monsters I would have to battle to get there. The Subway in the main refectory had closed during my brief misadventure in the Red Room. It all seemed hopeless. But then, amidst all the chaos and uncertainty, a deep peace came over me as I realised what I had to do. 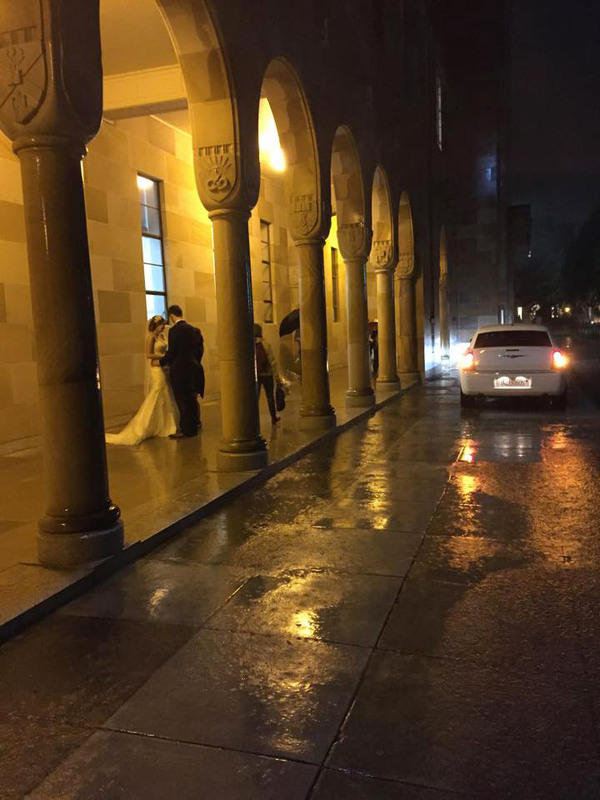 After many, many years as a UQ student, the moment had finally come. It was time for me to order the lasagne from the Pizza Cafe. And let’s be honest… ‘enlightenment’ wouldn’t make much more sense. The guy at the counter hesitated. ‘Er… yeah, I think we have some of that left’, he said with a slight quiver in his voice. Left from when, I thought; but there was no turning back now. I placed my order, took my buzzer, and waited for what seemed like much longer than it should take to microwave a single portion of lasagne. That is, of course, unless it was frozen. Not wanting to pursue that line of thinking any further, I distracted myself in any way I could. 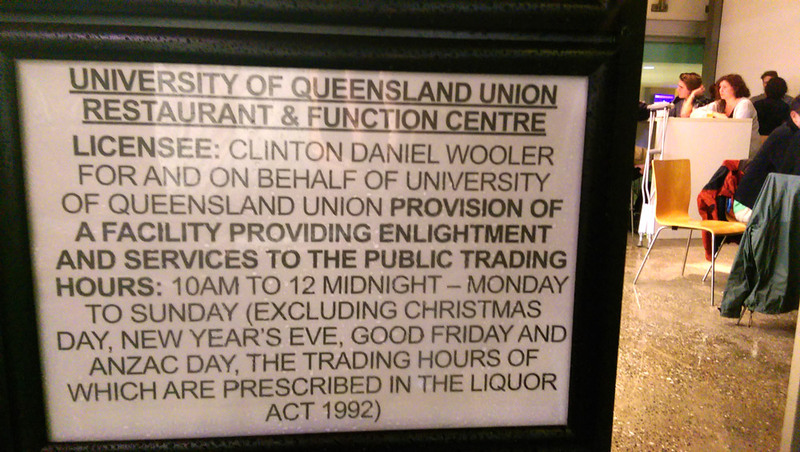 I discovered, for example, that the notice advertising the UQ Union’s liquor licence contains the word ‘enlightment’, which, as far as I can tell, does not appear in any English dictionary. Finally, the lasagne emerged. I could doubt its existence no longer. It was presented without fuss in a Chinese food container — or rather, two Chinese food containers, one stacked into the other so you could carry the superheated payload without burning your hands. All of the signs were pointing to this being a rather underwhelming culinary experience. And indeed, I have very little to say about the lasagne, except that it was not entirely incompatible with the house Merlot. Perhaps its greatest virtue was the generous portion size, because by the time I had finished eating, the rain had stopped. The gods had seen and rewarded my courageous act. It was time to head home. 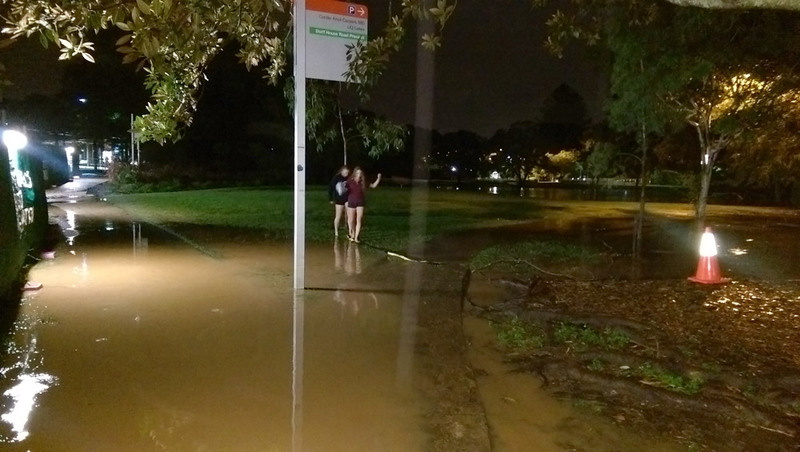 The path to the UQ Lakes bus stop, just before 8pm. 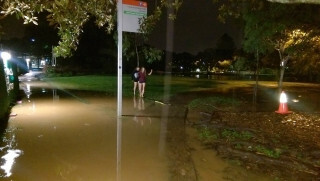 The bus stop by the UQ Lakes could now be reached on foot, though gumboots would have been preferable. If there had been public transport delays earlier, they had passed. In what seemed like no time at all, I had made it to Rocklea Station (yes, for the last two years, I have been living at Rocklea). Only a light drizzle persisted as I walked home, but the scale of what had just happened was plain to see. Under the rail bridge at the end of Muriel Avenue, where the road crosses Rocky Waterholes Creek (a tributary of Oxley Creek), a car was stranded under more than a metre of water. I would have taken a photo, but I didn’t want to interfere with the police. On the other side of Fairfield Road, the usually modest stream had become an expansive lake, nearly lapping at the footpath along Sherwood Road. Nearby, Melbourne Street — which I’ve heard is one of the lowest-lying streets in Brisbane — was almost entirely underwater. 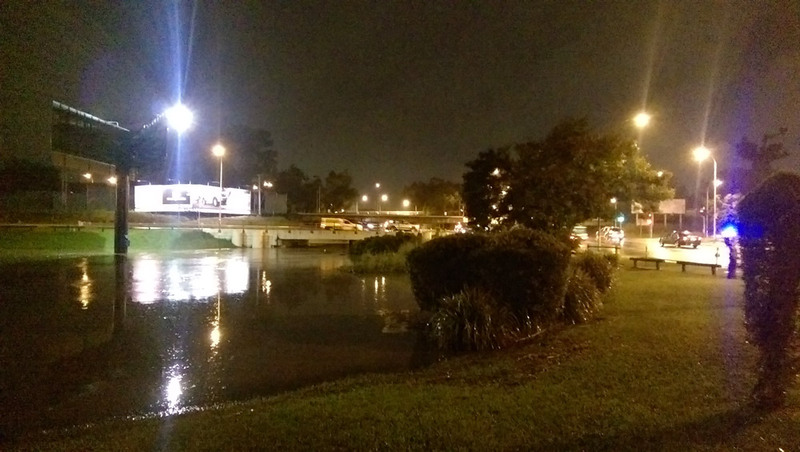 Rocky Waterholes Creek, looking towards the intersection of Fairfield Rd and Sherwood Rd, 8:33pm. 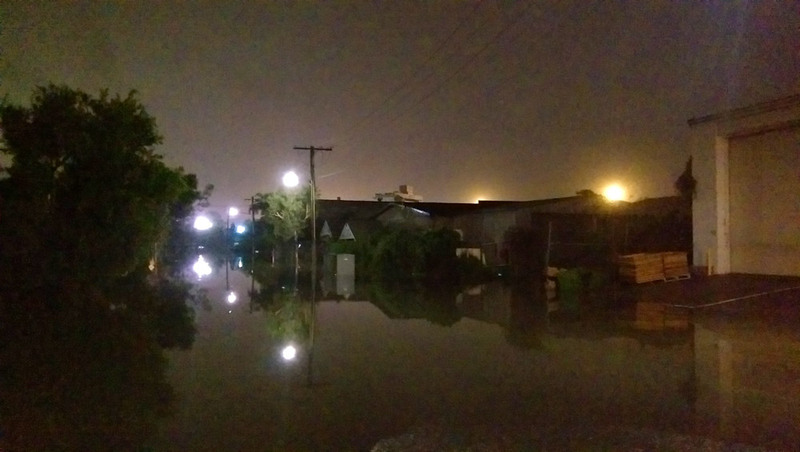 Melbourne Street, Rocklea, flooded by Rocky Waterholes Creek, 8:42pm. The corner of Elmes Rd and De Hayr St, Rocklea, at 4:28pm, Saturday 2 May. 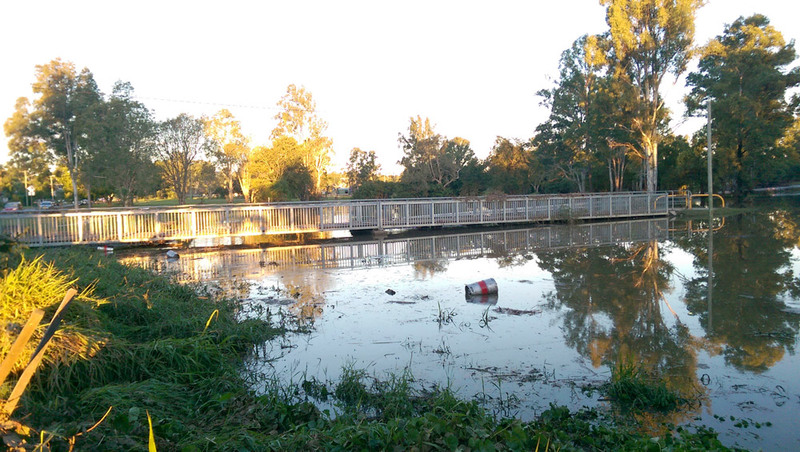 Kookaburra Park, Rocklea, at 4:43pm, Saturday 2 May. 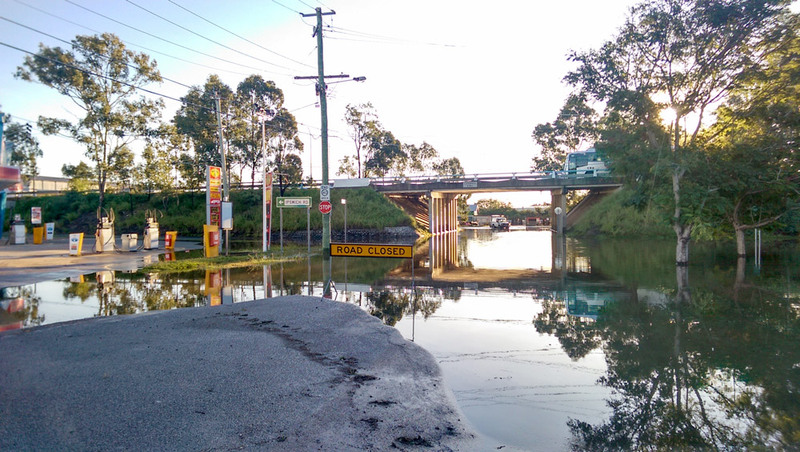 The end of Boobock St, Rocklea, flooded by Stable Swamp Creek (4:50pm, Saturday 2 May). 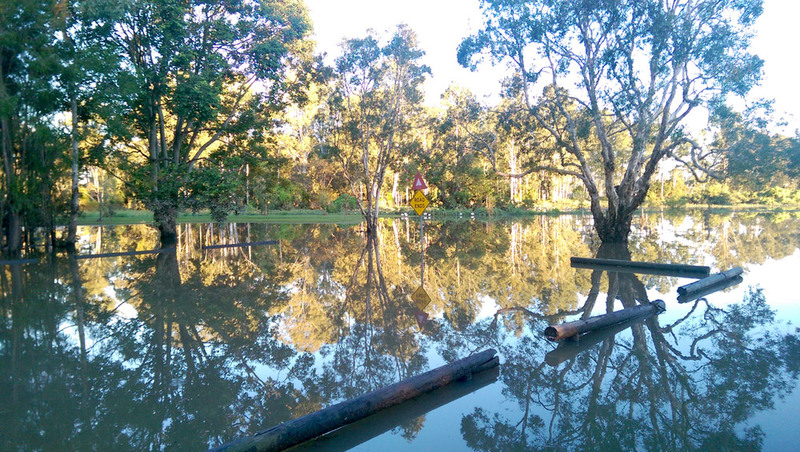 Kookaburra Park, Rocklea, flooded by Stable Swamp Creek (4:45pm, Saturday 2 May). These creeks were not like the ones I grew up with in Brisbane’s hilly western suburbs. 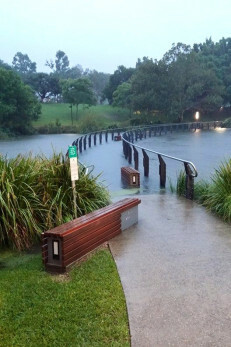 When Ithaca Creek or Toowong Creek flooded, they did so quickly and spectacularly before receding just as fast. Here on the floodplain of Oxley Creek, a different logic holds. This landscape floods more gently and expansively, and drains more slowly. 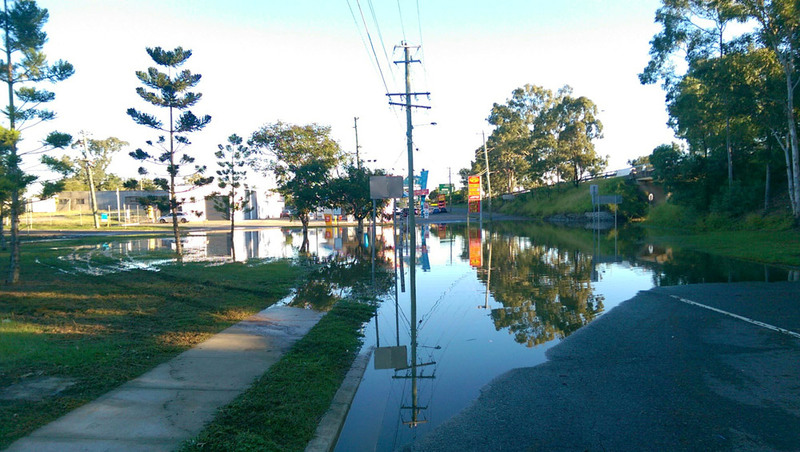 Eighteen hours after the rain had stopped, these parts of Rocklea were still submerged. This is not to say that the water hadn’t receded since the night before: there was evidence that it had been much higher. The surrounding streets were lined with flood-damaged furniture and appliances that would have to go to the tip. People were out chatting with their neighbours, comparing the damage that their homes had sustained. But the clearest indication of how high the water had been was the debris jammed into the railing of the bridge over Stable Swamp Creek. 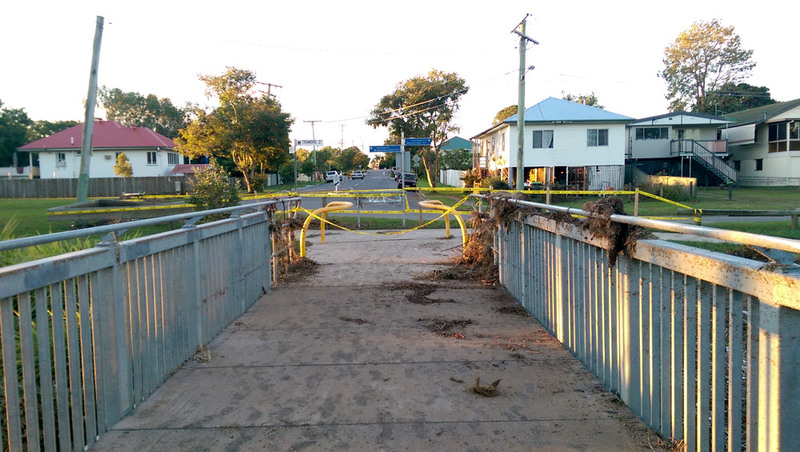 Debris in the railing of the bridge over Stable Swamp Creek. 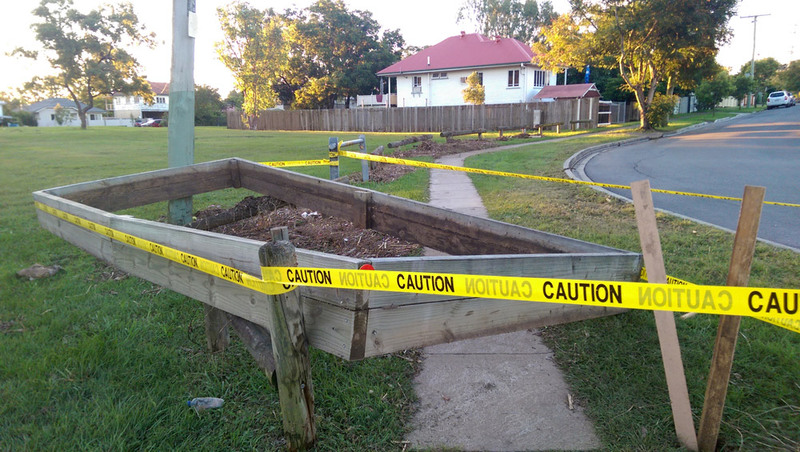 A wooden… thing, deposited by the floodwaters in Kookaburra Park, Rocklea. 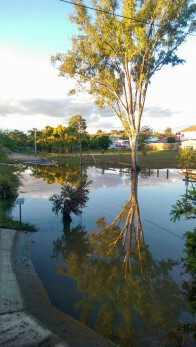 Flooding in Boobock St, Rocklea, 4:53pm, 2 May. While taking these photos, I wondered how all the rain might have affected the floodplain that I used to live on — that of Western Creek, in Milton, Auchenflower and Rosalie: the one that this blog is supposed to be about. Surely Gregory Park and Milton Park would have gone under, and perhaps parts of Norman Buhcan Park as well. And the gullies in the headwaters of the catchment must have been gushing. But I confess that I have no idea what happened in those places. I have heard nothing and have seen no photographs either. So, here’s a call-out to anyone who witnessed or photographed the Western Creek area during or after the rain on 1 May 2015: Please share your stories in the comments below, or by contacting me directly. I don’t think the comments let you add photos, but if you are happy to send photos to me, I will add them to this post or create a separate gallery. This entry was posted in Short articles and tagged floods, Oxley Creek, rain, rocklea, Rocky Waterholes Creek, Stable Swamp Creek, UQ by angusv. Bookmark the permalink. Great to see you posting again. I don’t have any photos to help but the Ashgrove golf course green resembled a river. 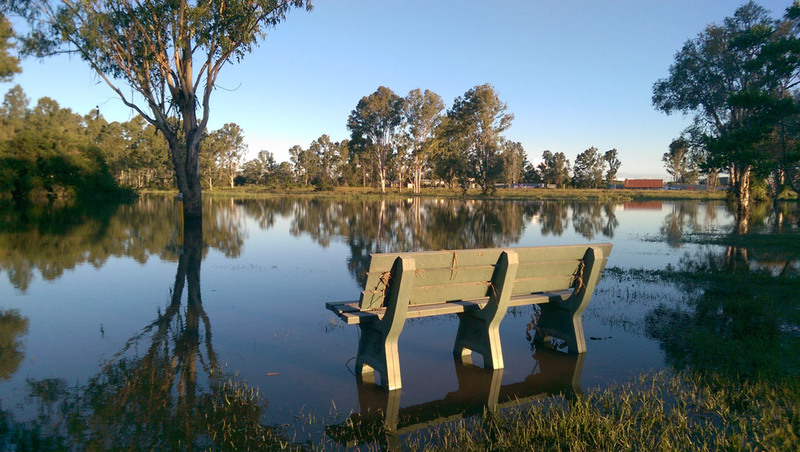 As for Rocklea, the floodplain is obvious isn’t it! Great to catch up with Once was a Creek again, and find a fresh post. I too have found myself contemplating going out in a downpour to see some water in the watercourses, most recently at J.C. Slaughter falls at Mount Cootha, which barely runs most of the time, but judging by the boulder strewn creek beds, must be an impressive sight.